« Flat Earthers and Blind Faith Stock Market Bulls – What Do They Have in Common? That’s a big “if” at the moment. Let’s face it; few people are “keeping their heads” right now. We’re drowning in a reactionary stew where everything from an exchange of ideas to a “taper tantrum” seems to cause a convulsive panic in the stock market. Admittedly, October has always been a devilish month for Wall Street. Black Tuesday was October 29, 1929. Black Monday was October 19, 1987. And the crash of 2008 happened on October’s doorstep on September 29, 2008, when the Dow dropped over 777 points. On October 10 of this year, the Dow dropped 832 points – the third-worst point drop in history. These are the days of falling acorns and Chicken Littles! It’s in this climate – despite historically low unemployment, robust GDP, and soaring consumer confidence – that 800-plus point sell-offs are even possible. The problem is not just the prevailing concerns about high debt, trade wars, and rising interest rates; it’s the collective uncertainty and reactionary group-think over which we have no control. That’s the conclusion of the well-respected research firm DALBAR. They consistently find that the average investor is lucky to even beat inflation over the long term. And history indicates it could take years… or even decades… just to get back to where you were. There IS a better way. What if you could have a secure retirement, safe from all the market madness and shielded from the herd mentality of the masses? What if your nest-egg went up ALL the time – not down, or sideways or plummeting on a tsunami of bad news? What if your future quality of life did not rest on the rationality of the typical investor, or whether the news of the day is good, bad, or downright terrifying? Bank On Yourself allows you to take REAL control of your financial future – not just the part where you check a box to indicate how risk tolerant you are. 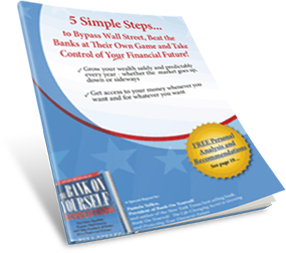 The Bank On Yourself method features supercharged dividend-paying whole life insurance, an asset that has thrived in every market crash and held its value through every financial panic for more than 160 years. “Control your destiny or someone else will,” warned Jack Welch, the former CEO of GE. A Bank On Yourself plan provides peace of mind amid the panic, taper tantrums and hysteria that has come to dominate today’s investment and savings environment. Request a free Analysis here to take the next step. The only regret most people say they have about Bank On Yourself is that they didn’t start sooner, so please don’t put it off.